Zoology is “the scientific study of the behavior, structure, physiology, classification, and distribution of animals.” Often comparisons are drawn from animal behavior with human behavior, especially in regards to mating sequences. Male Dawson’s bees (Amegilla dawsoni) are large burrowing bees that nest in the soil of the Australian outback. During mating season, the males will emerge from the soil before the females and wait. Larger males will patrol the entrance and smaller males will patrol the perimeter. 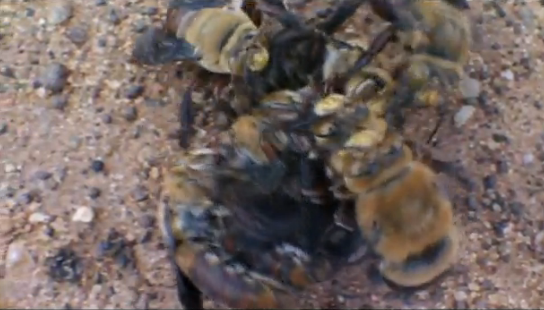 Once the females emerge, war breaks loose as male bees will kill each other in order to attain a female. In the end, at least one male will emerge while most perish. Application to human society: Competition. There is no guarantee that a male, bee or human, will attain a partner and advance their genetic code into the next generation. Males must compete to prove their genes worthy. Interestingly, there are two strategies employed by Dawson’s bees and yet it is unclear whether the larger male bees win due to size or smaller bees win due to strategy. Regardless, every generation, bee or human, will produce two types of males with two types of strategies. This entry was posted in For Men, Relationships and tagged dawson bees, male, mating, zoology. Bookmark the permalink.